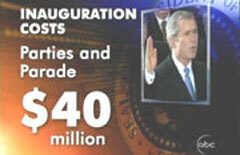 Did NewsBusters Help AP Notice Inauguration Spending Hypocrisy? On Saturday, the Associated Press published an article that not only questioned the rationale behind President Barack Obama spending huge sums of money on his inauguration while the economy is in the middle of the worst recession in decades, but also noted how critical some were four years ago of how much President Bush was spending on his second inauguration. Interestingly, NewsBusters Senior Editor Rich Noyes, in a piece that was linked by the Drudge Report Wednesday, wrote about how the AP bashed Bush for his inaugural spending four years ago but was arguing for extravagance now. Do you think the AP noticed? Unemployment is up. The stock market is down. Let's party. Obama's inaugural committee has raised more than $41 million to cover events ranging from a Philadelphia-to-Washington train ride to a megastar concert with Beyonce, U2 and Bruce Springsteen to 10 official inaugural balls. Add to that the massive costs of security and transportation — costs absorbed by U.S. taxpayers — and the historic inauguration will produce an equally historic bill. New York Rep. Anthony Weiner, a Democrat, suggested inaugural parties should be scaled back, citing as a precedent Roosevelt's inauguration during World War II. See some similarity? You think the AP saw Noyes's piece and were shamed a bit by it? Regardless of the answers, please note that Apuzzo wasn't apologizing for the wire service's own hypocrisy, as there was no specific reference in his piece to how the AP admonished Bush's inaugural spending four years ago while applauding Obama's extravagance today.